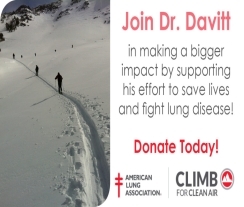 This June, Dr. Davitt will be Climbing for Clean Air as he reaches the summit of Mt. Hood. Climb for Clean Air is a mountaineering training and fundraising program designed to support the American Lung Association of the Mountain Pacific’s mission of saving lives by improving lung health and preventing lung disease. 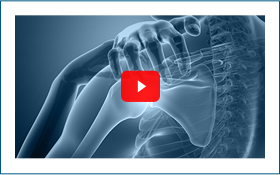 “As an orthopedic surgeon, it might seem unusual to be involved with the American Lung Association. However smoking and nicotine use is one of the leading causes of failure of bone healing. I am joining the Climb for Clean Air to encourage my patients and people everywhere to stop smoking and increase awareness of the negative impacts of tobacco use on the healing of broken bones. People who smoke or use nicotine containing products have a significantly higher risk of a broken bone not healing – known as a nonunion. Nonunions can lead to loss of function, prolonged time out of work and play, and the need for further surgery. Those patients who are able to stop smoking greatly improve the likelihood of successful healing and putting their life back in motion. Chances are you know someone who has faced the challenges of quitting tobacco use or other lung problems such as asthma, COPD, lung cancer or air pollution. By making a donation on my behalf, you will be helping the American Lung Association provide community based education programs, fight for cleaner air standards and fund life-saving research. 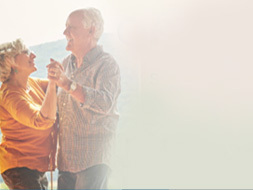 With your help, we will fight against lung disease and for lung health. We will be making a positive difference for all of the people trying to quit smoking so bones can heal, the parents who have a child with asthma, the people who struggle daily with COPD and the mothers, fathers, sisters, brothers, children and friends who get diagnosed with lung cancer. Every donation I receive helps make a bigger impact. Please help support my efforts to save lives, donate now.